160 days before Christmas! Here’s a fun and quick project for you. Chain 100 and leave 5 inches tail in both ends, cut. Cut 30 pieces of 4 inches yarns. This is the instruction for 5-points, 6-points, 7-points, 8 points and 9 points leaves. Make one of each. Round 1: Chain 4 (count as dc & chain 1) *2 dc, chain 1* repeat 4 (5, 6, 7, 8) times, dc and slip stitch in chain-1 space. Round 2: Chain 5 (count as dc & chain 2), dc in the same chain-1 space. *skip 2 dc, dc-chain 2-dc in chain 1 space* repeat 4 (5, 6, 7, 8) times, slip stitch in chain-2 space. Round 3: Chain 1 *sc, hdc, dc, trc, ch 1, slip stitch in the top of tr, dc, hdc, sc* in each chain-2 space, slip stitch, fasten off and weave ends. You should have 5 (6, 7, 8, 9) points. 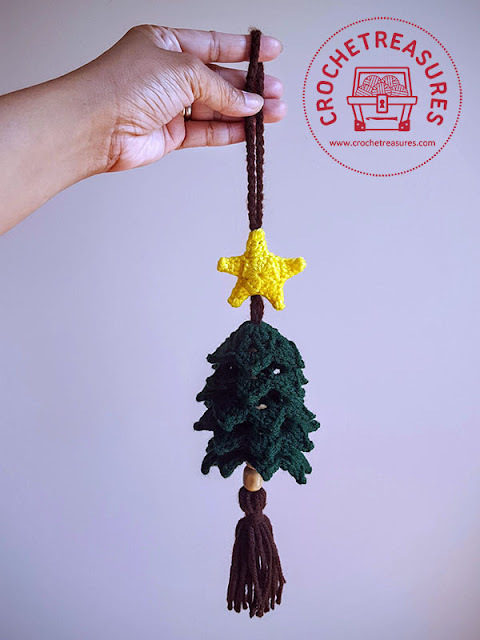 Download the pattern here: Simple Star Ornament. Make two pieces and leave a long tail for the second one for sewing later. Tie the two ends of the hanger. Place the cutted yarns in the end of hanger and tie it using the ends. String the beads and the leaves alternately into hanger. Sew the two star together and don’t forget to sandwich the hanger.